Hi everyone I'm Jack Red, I missed out on a lot of Rare classics growing up. A friend of mine did introduce to two N64 games that is in Rare Replay. Rare wanted to represent 30 years although the early titles included came from another company the founders worked for prior. I would even say for all purpose & a great candidate for one of the greatest Xbox One games I ever played. ZX Spectrum, NES, Arcade, Nintendo 64, Xbox and Xbox 360 are all the platforms they brought together. Most game compilations focuses on one or two consoles. The fact it can run six different platforms for the most part good is impressive. Although some of their Xbox 360 games do get some slowdowns not present from disc versions. Rare Replay gave us a lot of their finest fan favorites. This has one of the most achievements on Xbox One. This is a great starter game for the console plus you can score possibly a few thousand gamer score. If you are really good you can get over ten thousand gamer score. I never played an ZX Spectrum outside this compilation. I am very surprised I love the original Jetpac game. I also like the newer Xbox 360 game that also includes the classic game. Most games are present in their entirely with one reasonable presentation change to Conker's Bad Fur Day. More recently it's remake Conker: Live & Reloaded became playable on Xbox One. Up til the N64 games, the earlier games has a few added features to help with the experience. Mostly infinite lives but there isn't much changes between the games. You can rewind possibly saving you from dying. A feature some compilation taken since this game. I should mention all Xbox 360 games and three N64 games are from Xbox 360 that moves you away from the compilation to play them. Yes their achievements still affects unlocking stuff & going higher in the ranks. There is a great variety of games here. Obviously their N64 line up is the best for many great reasons. A lot of people would say Xbox 360 being the worst but most games on ZX Spectrum isn't for me sorry. It can be very time consuming going the distance. 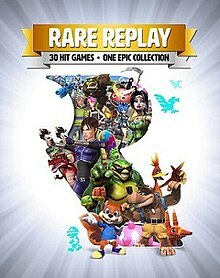 Some of my favorite Rare games are Perfect Dark, Battletoads Arcade, Killer Instinct Gold and Banjo series. I do like the creativity in Banjo-Kazooie: Nuts & Bolts but it felt like a very different game from the first two games. A good number of these games has great controls while others can be frustrating at first to learn. When it comes to the music majority of these really delivers. Yes their respective codes & unlockables are still present. Keep in mind, Perfect Dark was given an HD face off. In Banjo-Tooie's case they fixed what became a mistake in the original N64 version. At the end of each game they tell you what the next Banjo game going to be called. However this changed during development while working on other games. Thankfully their unique feature that originally couldn't get working on N64 is working through Xbox 360 & One versions. Yes there is plenty multiplayer games this time around. I should mention what I considered to be the one unneeded criticism a lot of people gave Rare over this compilation. Rare has a history with licensed games like GoldenEye, Beetlejuice, A Nightmare on Elm Street and several more. They need to understand despite Rare developing them, they don't own the copyrights to those franchises. Also some of them did change to some degree over the years making trying to get even one game difficult. Here's how I see it we got Perfect Dark, Banjo-Kazooie N64 and Conker's Bad Fur Day. I'm very happy having those through the compilation. I felt by having licensed games on it would take away from their theme. Which is suppose to represent Rare over the years. Some of these games can be very frustrating. I am not going to lie I constantly getting killed in Battletoads on NES but I still really like the game. Yes some of these games can be very short while others like Banjo-Tooie can be long. I should bring up both Xbox 360 Viva Pinata games were never meant to be beaten. Those were meant for building a new small world while all kind of creatures visits you. Honestly I'm very surprised Microsoft allowed Conker's Bad Fur Day in the compilation. A game full of movie references & possibly one of the most disgusting games I ever played. It so happens to be one of the funniest games I ever played. I really enjoyed the multiplayer being one of my favorites among N64 games in general. I do like every achievement helps to increase the replay value of the compilation itself. A very large amount of achievements won't take long to get. Yes it is among my Xbox One collection one of the biggest games in size around a little over 50GB. Although that does include games that are pulled right from their online service. Rare Replay is very true to it's name. Honestly I really don't think any Rare game can top this one. I am aware they recently working on adding stuff to Sea of Thieves. Just in case anyone wondering no I don't own that yet or Conker remake. It is kinda weird Grabbed by the Ghoulies got added on Xbox One separately. I do enjoy watching the musical number they had to open the game up. Featuring a lot of their characters present in all these games. There was some additional videos on their YouTube account if you want to learn more behind the scenes stuff. Rare Replay is easily one of my favorite big Xbox One games.